This week, the music world sees its first huge release week of the year. 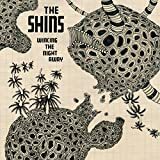 The Shins get another chance to "change your life" this week (if they haven't already) with their Wincing the Night Away album. The other two huge indie rock releases this week worth checking out are Of Montreal's Hissing Fauna, Are You the Destroyer? and Deerhoof's Friend Opportunity. Beyond the big three albums, releases by Alisdair Roberts, Fujiya & Miyagi, Julie Doiron, Kristin Hersh, Pinback frontman Rob Crow, Six Parts Seven and You Am I and three Boredoms reissues and a Paul Weller box set combine with many others to make this week's music shopping a potentially expensive proposition. having already seen Jesus Camp, my music preorder was limited to the Criterion Collection editionYojimbo & Sanjuro - Two Films By Akira Kurosawa.